Winter in the Poconos is typically incredibly cold and harsh. Last year was the coldest on record. We even had a snow storm before Thanksgiving! While this year has been mild so far, I know better than to get too comfortable and think it’s going to stay like this! One year, we had beautiful weather throughout half of December, then a blizzard on Christmas! 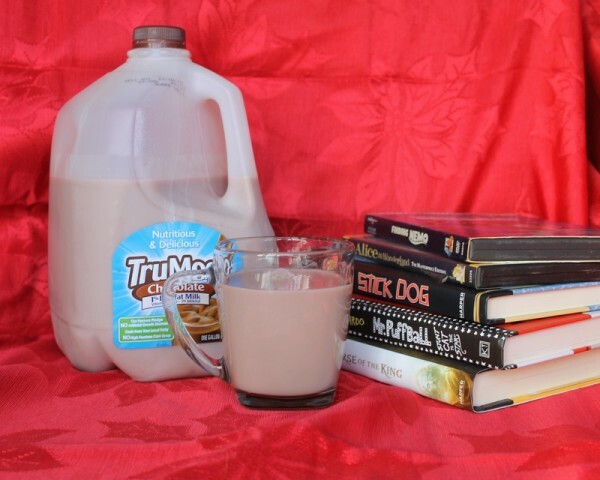 Before cabin fever even has a chance to start setting in, I try to plan ahead and stock up on good books, great literature-based flicks, and plenty of Jake’s favorite treats, like TruMoo Chocolate Milk! We love to try it hot during the cold months. Jake asked me how he can talk to a girl he likes. I told him to find common interests. He said she likes to read. I told him to read some of the books she likes, then talk to her about them. He said “mom, that’s not dating, that’s a book club!” Well, kid, you’re ten! Book club is as close as you’re getting to dating for a LOOOONG time! Anyway, whether our book discussions prepare him for talking to girls (eeek!) or help him do better in school, I just know it’s fun to be able to share my favorites with my little man! If you have a reluctant reader, movies are a great way to entice them to dive into literature. I know it sounds counterproductive, but hear me out. More and more movies are based on books these days. Grab a stack of book-based films on DVD and have a movie marathon. Then follow up with a readathon of the books that the films were based on. This even works with younger kids, just choose fairy tales instead of dystopian fiction or teen dramas. Compare and contrast the movies and books, talk about what was different, what you both wish they added in, what you thought of the actors who played the characters, etc. While I usually recommend reading the book before the movie, sometimes you have to bend that rule to get kids interested in the written account. Creating your own trivia game based on the movies or books you enjoyed. Of course, no matter which activity you choose, you’ll need refreshments! 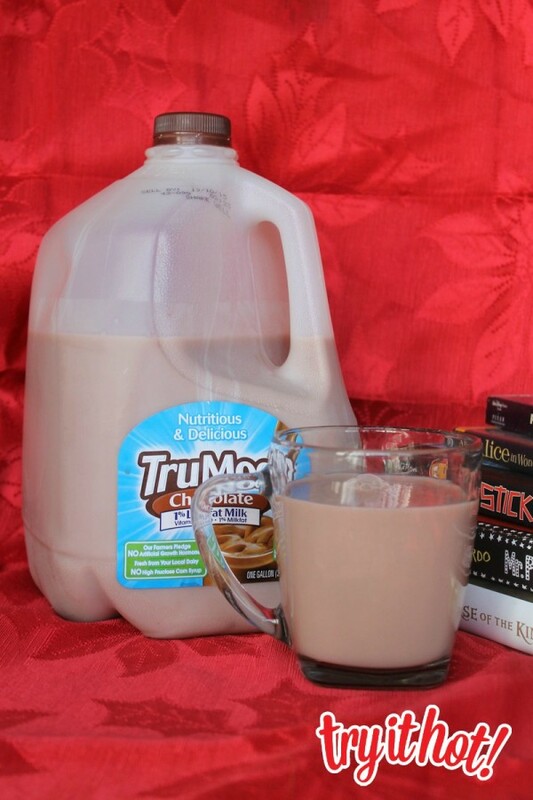 Fuel your marathons with delicious hot TruMoo Chocolate Milk! Jacob is absolutely crazy for TruMoo. It’s a permanent item on my grocery shopping list. He’s always loved chocolate milk, but one day he tried TruMoo Chocolate Milk and that was it. There are no alternatives for him now. He doesn’t ask for chocolate milk, he asks for TruMoo. Thank goodness it’s available nationwide in grocery stores so I can always find it! Honestly, I’m happy he likes it so much. He’s such a picky eater, so I know he’s getting plenty of calcium and Vitamins A & D. TruMoo is made with real milk (and NO growth hormones or high-fructose corn syrup) and just the right amount of chocolate to make it fabulous. It tastes just as delicious hot as it does cold, especially during those frigid winter days! I like mine with whipped cream on top, but Jake prefers his plain. He’s a TruMoo purist! He’ll put whipped cream on other stuff, but he likes his “Moo” just the way it is. Take advantage of the cold months to open up whole new worlds to your child. Make sure you grab plenty of books for you too! If you show how much you love reading, your kids will gravitate towards books as well. Don’t forget the TruMoo! 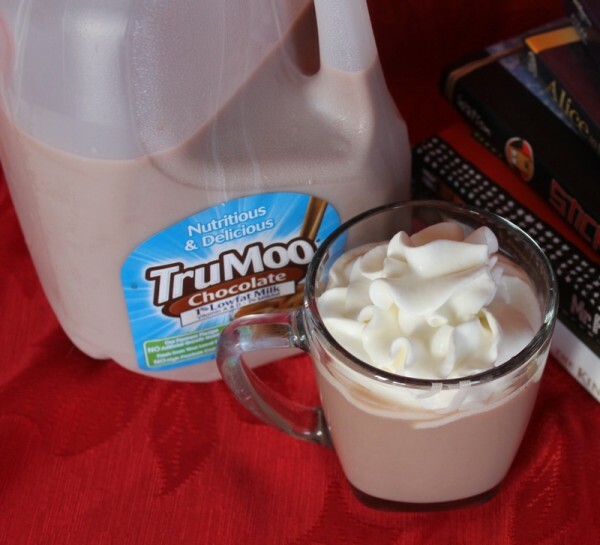 Looking for more great ways to incorporate TruMoo into your winter fun? Check out TruMoo on Facebook and get inspired to Try it Hot with TruMoo on Pinterest! What do you do to beat back cabin fever? Tell me your favorite indoor winter activities! 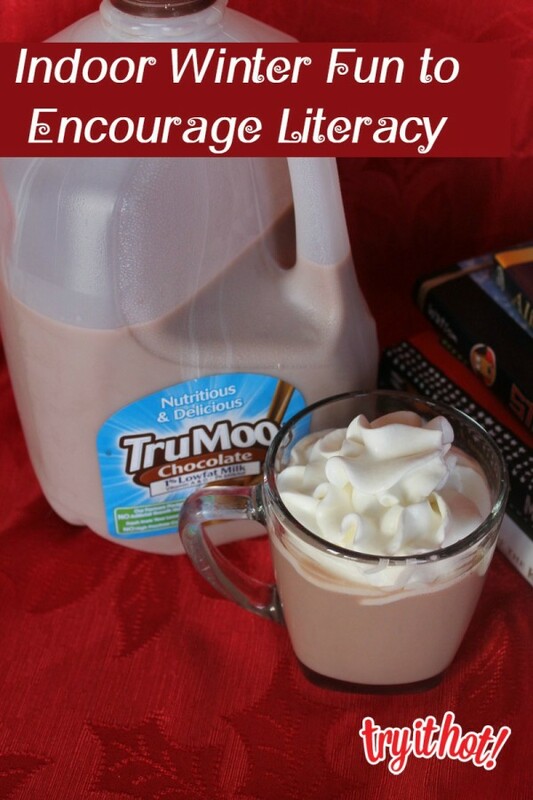 I always see bloggers talking about TruMoo, and I still haven’t tried it yet. I really need to. I am so lucky that both of my boys love to read. I think it’s so important for kids to read. I like the idea of having a movie marathon and a trivia game. We definitely love our TruMoo too. Charade style games are really fun to do with the whole family and it makes for great memories too. I will have to gift TruMoo a try. Hot chocolate is still a favorite in my house! It’s adorable, he’s asking you for dating advice, but you’re right! He’s only ten, lol! I love that you guys share books and make reading a quality time. That’s rare! what a great program!!!!! Chocolate milk looks great too!! haha tell your son to join a book club to meet girls… Kids say and think the funniest things!! I wonder if we could get more kids interested in books if they thought there would be dating prospects from it?? My boys get to have chocolate milk very rarely, but when they do it is True Moo. This is a great list of indoor activities to keep us busy during the Chicago winters. how terrible and I that i “force” my kids to read 30 minutes a day. For this, my little one will extend that into hours! Truemoo sounds lovely I’ve not heard of it before . Truemoo sounds delicious. I see a lot of bloggers featuring this chocolate drink. Too bad we don’t have it here. Never really had cabin fever. We get a little rain here and there, but overall, we watch movies. My girls are too little to sit and read for too long. I’ve never had TruMoo, but it looks pretty good! My sons would love it. And it’s cute how your son wants to know how to talk to girls! This looks yummy and something I am sure my kids would love. Thanks for sharing.